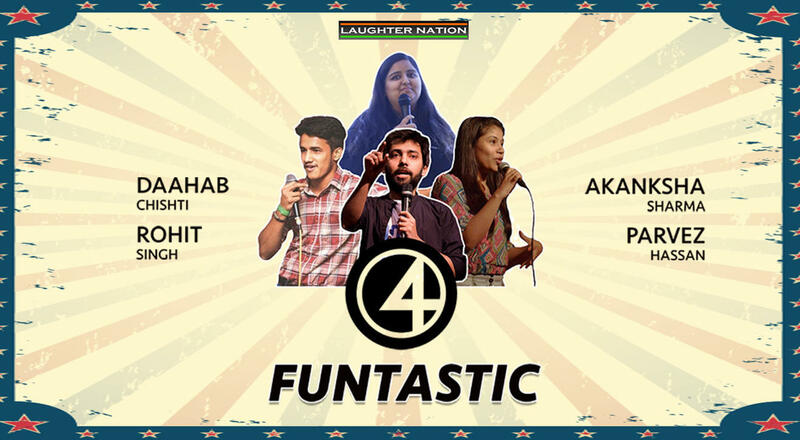 Funtastic 4 is a collaboration of 4 funny people from the comedy circuit who are raring to make it big. They have their foot in and it's only a matter of time, that you keep seeing them regularly. They are already killing it on stage – be there to watch them. A stand-up comedian, 23 years old and has been pursuing stand-up comedy for almost a year now. He has performed at various comedy clubs (Canvas Laugh Club, Playground Comedy Studio, Akshara, MooDe Playground), cafes & at various college fests. He has won a number of open mics at CLC and also become an onboard member of Canvas Laugh Club. At the stage, he mostly talks about his views on the society, which mainly focuses on things related to love, religion & politics. He presents his content in a very satirically and politically accurate manner, which comes from his personal experiences and also at the same time turn out to be very relatable to the people sitting at the other end. 10 tablespoons of Punjab, 6 tablespoons of cuteness with a pinch of Pakistan and some extra fat; oh sorry too much fat, yes this is Daahab Chishti. To make this recipe more interesting, she is now trying to temper it with comedy and some wittiness. Sometimes a poker face, sometimes the swag and sometimes laughing on his own jokes. His imaginative style of humour is what makes everyone go nuts. Struggling for a job and beard, Rohit is the one who will try to make you laugh with his clean, observational jokes. Akanksha Sharma, Bhramin girl, fair, 5'2" in height, lost her graduation degree but runs her career on a creative degree. Watch her talk on the not-so-typical mom dad situation and more. Self-qualified voice-over artist, YouTuber, anchor and now a stand-up comedian. She loves happy faces around her, so she cracks jokes.